As the forums are as dead as ScrollQuest these days, I was plunking around looking for other hunts. I noticed there was a forum in 'Other Hunts' for the Voynich manuscript. That thing is arguably a hoax, but an old one, and a mystery nonetheless. But it got me wondering about Kryptos. Like Voynich, Kryptos is great unsolved code/puzzle. The only prize is guaranteed fame (for 15 minutes, at least! ). It is real, and it is not a hoax. The Kryptos has bested the best cryptographic minds on the planet for the last decade and a half. Three out of four sections of the Kryptos statue have been decoded. One section remains, but the creator of the Kryptos says once the final section is solved, you will be right back at the beginning. This spring, a correction to the solution of the third section brought the Kryptos statue into the national spotlight once gain for a short while. I have seen Twelevers solve puzzles more difficult than those in the first three sections of the Kryptos. This is not beyond the talent of this group. My questions are, is this something of interest to Tweleve, and might we want to start a new forum on the topic? The closest thing Kryptos has to a 'official' forum is a Yahoo group run by Elonka Dunin. I monitor this group, but working with a Yahoo group is about as much fun as using a dialup connection. The software here on Tweleve is vastly superior. That group has about a thousand members, but most sign up soon after learning about Kryptos, then quickly lose interest. They have small core group of serious cipher nuts who keep hacking away at it. The artists has stated that there are visible clues to the secret of Kryptos that have not been figured out yet. This is where I think Twelevers have the advantage. This should not have taken 9 years to decrypt. I think if there was a pot of gold or a bejeweled amulet up for grabs, Twelevers would have solved this in a matter of weeks or months. I'm game. Anyone have a transcript of the unsolved section? Cool. I didn't want to have the hunt here in the bene lounge. Just want to see if there is enough interest to warrant setting up a forum for it. There is no official sponsor for Kryptos. The sculptor is not putting up any prize for solving it, although he does wish it to be solved. The only group out there working on this is a yahoo group moderated by Elonka Dunin, a game developer, hacker, and cryptography nut. She is not an armchair treasure hunter, nor are most of the members of the Yahoo group. 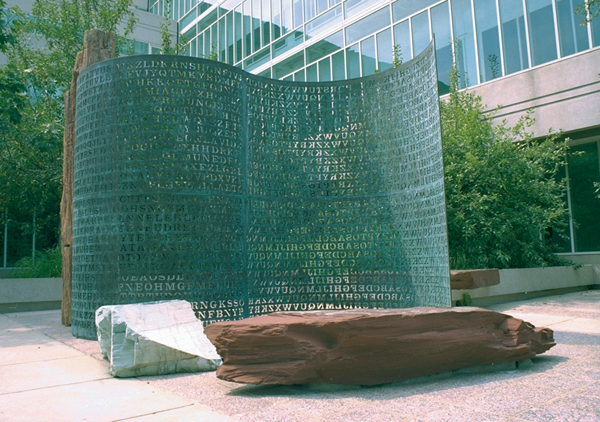 Also, Dan Brown's next novel, The Solomon Key, will involve the Kryptos sculpture. He made this know via puzzles on the dust jacket of The DaVinci Code. When Solomon Key comes out next year, the Kryptos could get a huge increase in popularity. We could benefit from that by having the best discussion forum around on the Kryptos.